Entrepreneurs are a unique group of people. Not only do they think differently; they act differently. They draw on personality traits, habits and mind-sets to come up with ideas that straddle the line between insanity and genius. But just because you’re an original thinker and came up with an idea to replace gasoline in cars doesn’t mean you’re cut out to be an entrepreneur. 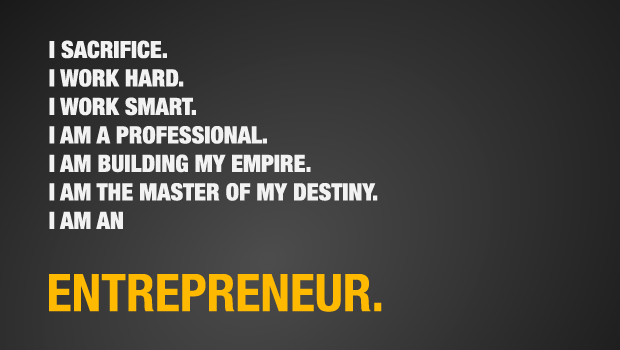 If you ever wondered if you were an entrepreneur, check out the following list. You may not have all these traits or skills, yet if you have some, this is a pretty good indicator that you have what it takes. 1. You come from a family of individuals who just couldn't work for someone else. Your parents worked for themselves. Though this isn't true for every entrepreneur (myself included), many have a family history with one or both parents having been self-employed. 2. You hate the status quo. You’re a person who is always questioning why people do the things they do. You strive to make things better and are willing to take action on it. 3. You’re self-confident. Have you ever met an entrepreneur who was pessimistic or self-loathing? After all, if you don’t have confidence, how can others believe in you? Most entrepreneurs are very optimistic about everything around them. 4. You’re passionate. There will be times when you spend an excessive amount of time and do not make a dollar. It’s your passion that will keep you going. 5. You don’t take no for an answer. An entrepreneur never gives up -- ever. 6. You have the ability to create unlikely partnerships from out of nowhere because of your ability to connect the dots. People tend to gravitate toward you because you are likable. Many times this is because of your passion. 7. You spend more time with your co-founder than your spouse or significant other. 8. You dropped out of college like Bill Gates, Steve Jobs and Mark Zuckerberg. 9. The daily commute to your office is from the bedroom to the living room. 10. You were always a lousy employee and probably have been fired a lot. Don't worry; you're not alone. I personally have been fired several times in my life. Don't take it as a sign that you're a bad person. Sometimes it's in your DNA. 11. You’ve always resisted authority; that's why you've had a problem holding down a job. 12. You believe that there is more than one definition of job security: You realize that your job is safe as long as you are in control as opposed to relying on a boss who could ruin your career after one swift mistake. 13. Most of your wardrobe consists of T-shirts; some you probably got at SXSW. Others display your company's name or logo. 14. You have a competitive nature and are willing to lose. You always know that you can do something better. 15. You check GitHub when you wake up in the morning. 16. You ask to be paid in game tickets, shoes or whatever else you love. There are just some things that are better than money, right? 17. Your idea of a holiday is a working day without anything interfering with the tasks you really need to get done. 18. You’re unemployable, and there’s nothing wrong with that. Life skills are more valuable than the office politics commonly found at 9-to-5 gigs. 19. You work more than 60 hours a week; yet you earned more money at an hourly job when you were in high school. 20. You want to be in control and in command of your own company. You typically like overseeing most things that go on at your company. 21. You see opportunities everywhere. For example, you walk into a building and are curious about its worth or the companies inside. 22. The word “pitch” no longer has an association with baseball. 23. Your take a personality test, like one offered by the Enneagram Institute, and end up with a result calling you a "reformer type," someone purposeful, self-controlled and perfectionist. 24. You recognize that the best seats at your favorite coffee shops are those closest to power outlets. 25. You’re a logical thinker with ideas about how to correct problems and the overall situation. 26. Speaking of problem solving, have you checked to see if there's an app for that? Perhaps you've already begun to create a business model and the software architecture to see if it’s feasible. 27. You’re a people person. You have no problem communicating with people. 28. You regularly quote Steve Jobs mainly to keep yourself from falling to pieces. 29. You sold stuff as a kid like at a lemonade stand. Heck, when there were class sales, you were probably one of the top sellers. 30. You get more SMS alerts from people you follow on Twitter than from actual friends listed in your address book. 31. You’re a self-starter, meaning you don’t give up on a project until it’s completed. 32. No matter what you do on a daily basis, you always think of it in terms of delivering a return on investment. 33. Your dress code is shabby chic and your suit is just collecting dust. You prefer T-shirts and jeans over a suit any day. 34. You’re unrealistic. As an inventor or innovator, you kind of have to be this way. 35. You think outside of the box. If not, what will change? 36. You’re a charming and charismatic person. 37. Rules don’t apply to you. We’re not talking about breaking the law. Instead, you believe in efficiency and will bend rules to make things run smoothly. 38. You realize that you can’t do everything alone. You have an idea and can promote it but also know that you’re not skilled at every task of running a business. 39. You’re very opinionated. That's another reason you got fired a lot. 40. You’re unpredictable. As an entrepreneur, you know how quickly things can change. Thankfully, you're ready and willing to make adjustments. 41. You enjoy being with a group but don't relish much being alone. You probably get most energetic when working with groups of more than four people. 42. You’re determined. You have to make the impossible possible. 43. You have the support of your friends and family. These are the people who get you. And they’ll be there to support you along the way. 44. It’s normal for you to take a nap under your desk to catch up on sleep. After all, getting eight hours of sleep sometime between 10 p.m. and 6 a.m. is antiquated. 45. You’ve done the market research. You know that just because you have an incredible idea doesn’t mean that it’s profitable. But you’ve already looked into whether customers will make the purchase. 46. You surround yourself with quality people -- not leeches who will bring you down. 47. You’re a bit out there. Having the ability to create something out of nothing takes a mad-genius type of person. Remember, people thought Albert Einstein was insane before he proved the theory of relativity. 48. Did you ever ask your family, friends or significant other to send you a calendar invite so that you could talk for all of five minutes? 49. You believe that your time is worth more than money. 50. During your most recent rant about growth hacking, your spouse or boyfriend (or girlfriend) totally understood what you were saying. Even if you don’t have all the above traits right now, you’ll probably develop more of them over time. After all, being an entrepreneur is a lifestyle, not a job or hobby. I have several of theses traits and I have always wanted to open up a daycare that has a small sick room so that parents can still go to work. I also have other ideas and i have thought about doing an online class on small business. So this is really helping me push towards this dream.